NRA-ILA | Snap to it, Nevada! Your gun rights are under attack! Snap to it, Nevada! Your gun rights are under attack! If you haven't read the NRA's most recent article outlining former NYC Mayor Michael Bloomberg's plan to restrict Nevadans' gun rights using his billions to fund an anti-gun ballot initiative in 2016- then please go to NRAILA.org/NVRights before you read the rest of this email. But if you are aware of the current threat to Nevada gun owners- it's time for you to stand and fight with NRA starting in just a few short hours. Tonight, during the GOP Debate in Las Vegas, your NRA is unveiling its first-ever Snapchat filter just for Nevadans! In case you aren't familiar, Snapchat is one of the fastest-growing social media apps on the market right now. And tonight, we're calling on all Second Amendment supporters to use it to connect with their friends, family, and fellow patriots during the GOP debate in Las Vegas. Use our Nevada filter to spread the word about billionaire Michael Bloomberg's gun-control initiative! The NRA Snapchat filter gives voice to all Nevadans who support the Second Amendment and oppose criminalizing commonplace practices like sharing firearms at a range under the veil of "gun safety." We need your help in telling the nation that Bloomberg's measures have nothing to do with safety or addressing crime. His gun control initiative would only impact law-abiding Nevadans and divert already scarce resources from hard-working law enforcement agencies. We need to show Nevadans and the nation alike that when Bloomberg talks about so-called "universal" background checks, what he really means is making it so that members of the military could face criminal charges for having a friend store his or her firearms while deployed overseas. Bloomberg's "gun safety" initiative means if a victim of a stalker or domestic violence cannot afford to purchase a firearm for self-defense, she would not to be able to borrow a firearm from a friend until the very moment her attacker is standing over her with a deadly weapon. What Bloomberg's proposed measure means is that a grandfather hunting on BLM land could face criminal charges if he shares his firearm with his grandson. What Bloomberg's initiative actually means for Nevada is more propaganda and less freedom. We want you to send us your photos using the NRA Nevada filter (add username: TheNRA as your friend on Snapchat!) and tell Bloomberg to keep his money and his politics where it belongs- in NYC. It's important that Nevadans stand up for their rights and not let NYC money influence the future of Nevada. It's time to tell Michael Bloomberg that he can't impose his gun control agenda on the rest of the country. Nevadans' Second Amendment rights are not for sale! So snap to it, Nevadans! Use the NRA filter any time today between 2 – 8 PM PST and say, "Hey Bloomberg! Don't NYC My Nevada Gun Rights!" We look forward to chatting with you during tonight's debate! P.S. Don't forget to send us your snaps! 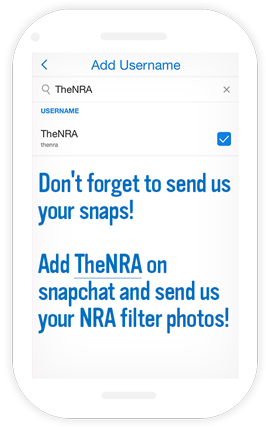 Add us (username: TheNRA) on snapchat and send us your NRA filter photos! P.PS. Don't have Snapchat? Click here to learn how to sign up and set up your account so you're ready for tonight's debate! It's easy!